For those keen to regain their youthful looks but are wary of invasive surgical procedures, then microdermabrasion is a good option for treating the effects of ageing and sun exposure on facial skin. Essentially, the top dead layer of skin is removed by gentle abrasion using tiny crystals, followed by suction. The result is fresher, younger-looking skin, smaller pores, reduced acne scars and – with several treatments – a reduction in fine lines and undesirable pigmentation. However, like all cosmetic procedures, microdermabrasion has risks and complications and it is important to understand these fully before deciding if this is the anti-ageing treatment for you. It enables you to return to your daily routine with minimal disruption after treatment – in fact, it is known as the “lunchtime cosmetic procedure”! Meanwhile, it is effective for a range of different skin problems, from generally dull skin to wrinkles, from age spots to acne scars and other superficial imperfections. It can be done on the skin of the face, neck, arms, chest and stomach (stretch marks), back, feet and hands. While microdermabrasion is one of the least invasive cosmetic procedures, with minimal side effects, it is not completely risks. In fact, it’s important to remember that no cosmetic procedure is 100% safe. It is crucial to discuss your medical history before hand to ensure that you do not have any contraindications, such as being on certain drugs and medications or being pregnant or nursing (or being a teenager) when the presence of certain circulating hormones may affect the results. In addition, those suffering from keratosis, diabetes, immune disorders, eczema, lupus, psoriasis, dermatitis or who have fragile capillaries, lesions, serious acne or active rosacea should refrain from undergoing microdermabrasion. This procedure is also ineffective on malignant skin tumours, warts and active herpes lesions. Side effects are rare and the only real risk is a possible discolouration on the skin (e.g. light or dark patches). This is probably less than the pigmentation changes and scarring that are common complications of other anti-ageing skin treatments. Other very rare risks include hyperpigmentaion, skin infections and skin injuries after the procedure, especially if equipment has not been properly sterilised. In some cases, certain people report increases skin sensitivity, especially to sun, and also flaking and redness following microdermabrasion but this varies from individual to individual. 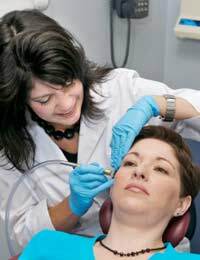 What Happens During Microdermabrasion Treatment? The skin is gently “sandblasted” using a microdermabrasion machine which combines a compressor and a pump in order to gently peel and remove the topmost layer of skin. The whole procedure usually takes about half and hour to one hour and is normally painless, although some people may experience a slight tingling sensation. The skin will look slightly red in the 24 hours immediately after the treatment and you may also experience slight itchiness and a sensation similar to being mildly sunburnt. Often, several initial treatments are recommended, spaced out over several weeks and then maintenance microdermabrasion treatments are recommended in the years following, spaced several months apart. To help avoid any risks and speed up recovery, it is important to avoid exposure to the sun for at least 7 days after the treatment and to use high factor SPF every time you venture outdoors, even if the weather looks overcast. UV rays can still penetrate through the clouds and your skin will have no top layer for protection. Don’t forget also to moisturise your skin thoroughly in the days following the treatment. Avoid any harsh products such as exfoliating scrubs and glycolic acid creams. In addition, before your microdermabrasion treatment, remember also to stop using any products containing retinol, salicylic acid (aspirin) and to also avoid sunbathing, waxing, collagen injections and chemical peels several weeks before the treatment.